The debugger feature lets you analyze a web page's code line by line. Pause/Resume - Halts or re-starts execution of the script you're debugging. Step Out - Runs the script until the current function exits. Script Chooser - This pop-up menu lets you select one of the running scripts in order to read its code, set breakpoints, and so forth. Script Filter - The script filter (which doubles as a search box) lets you type a string to filter what scripts should appear in the Script Chooser. Expand Panes - Expands or contracts the window to show or hide the sidebar panels. Debugger Options - Pops-up a menu to configure the debugger. Auto Prettify Minified Sources – If enabled, the debugger will automatically detect minified JS files and pretty-print them. Show Panes on Startup - If enabled, the debugger's two sidebar panes are visible when you first start the debugger; by default, they are not. 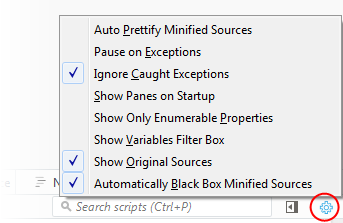 Show Only Enumerable Properties - If enabled, allows you to filter the displayed list of variables after the "Filter variables" search box to will be added the variables panel. Show Original Sources - If enabled, allows you to use source maps to see the original source for code. Automatically Back Box Minified Sources - If enabled, URLs with 'min.js' at the end will automatically be black boxed.